Why didn’t God save their house? Why was it destroyed? Rather than panic, take a moment to marvel! Isn’t it wonderful that God created your child with a unsuppressed, passionate sense of wonder and curiosity! (How will they find out about the world without cross-examination?) Thank God for their questioning nature! Back in the beginning of time God set in motion the creation of our world. God created our world to be ruled by natural laws. Take, for example, gravity: gravity is good – it keeps us from floating out of control! But gravity can also be bad – such as when an airplane looses power and falls to earth. It would be nice if God could save the airplane and temporarily suspend the law of gravity. But if that were to happen, we’d all go spinning off into space! Specifics in the case of a tornado: we have an unsettling mix of hot and cold air. Yet individually, hot and cold serve purposeful parts of our physical world. God doesn’t arbitrarily manipulate the laws of nature! I’m wondering if I can trust God? A valid concern! God gives us a choice. Point to Bible stories such as Joseph in Egypt; Joseph chose to trust God in spite of difficult situations he faced. He eventually saw a purpose for his suffering. (See Genesis 45:4-7.) Trusting God doesn’t make troubles go away; it does make troubles easier to handle. Create a family plan for what to do in a similar situation. Calmly hold a family drill. Are there questions you have or topics you’d like to see addressed? Fill out the form below to let me know. 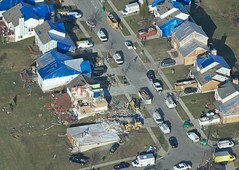 Damage in Dexter, MI March 2012 tornado by Andy Fowler, who licensed this photo on Flickr under a Creative Commons License.